T013-5 500TYPE EVA　5CARS EXTENSION SET on September.20 in Japan, also starts delivery for overseas soon. * Amazing body color rendering on 1/220 Z-Scale body! 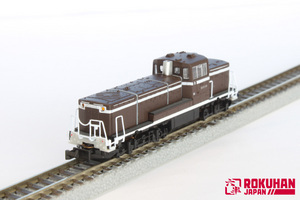 * Combining T013-4(G004-2) and T013-5(sold separately) makes full connection cars! Let's go the retail shop nearby you for reservation! We Rokuhan start delivery of G004-2 500 Type EVA Starter set on September.7 in Japan, also starts delivery for overseas soon. * Includes #1, #5(mortor car), and #8 car of 500 Type Shinkansen EVA! 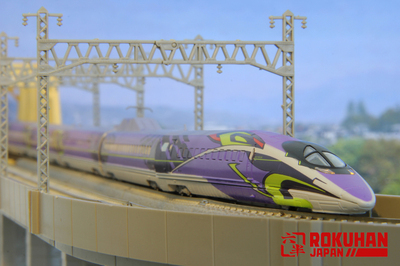 * Includes PC tracks and it provides amazing appearance with Shinkansen! * All you just need to get started is only to set each cars on tracks and connect controller! 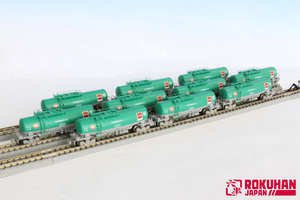 * Combining this starter set G004-2, and T013-5(sold separately) make full connection cars! 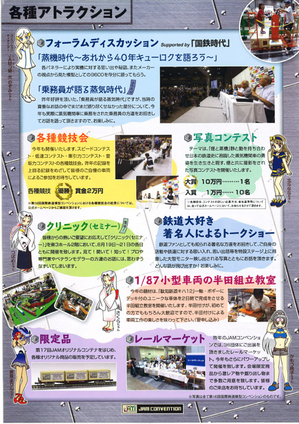 Report of TRAIN SHOW, "17th JAM Convention"
Thanks for your continued your interest in Rokuhan products! We ROKUHAN attended TRAIN SHOW, ""17th JAM convention" at Tokyo Big site, on August/19 to 21, and now we report its result! In this train show, we showed several new items. You already have known one of big coming, haven't you? Of course, we showed "e-train controller" and "500 type Shinkansen EVA version". And as new faces, "E6 type Shinkansen Komachi" and "C57 Steam locomotive" also showed its prototype each at our booth. These two new faces are still under development, please look forward to launching in market! In addition, we also showed new structure, "Convenience store" series, "Small house"series, and "Engine house"series. Already announced product, Island platform series are also shown. 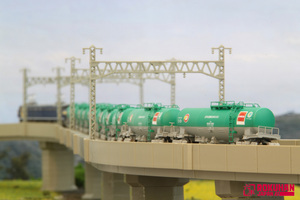 We are keep going to create not only train models, but also structures to make Z-scale market bigger! And we made ROKUHAN official diorama. This diorama is not so big, but we took advantage of its size "Z-scale 1/220", that's why we did any creation such complicated layout, making outstanding scenery. We rolled commuter train on below layout and rolled 500 type Shinkansen EVA version on above oval layout with huge speed! Thank you all for coming to our ROKUHAN booth, and hopefully we will come back JAM Convention! See you next year at show or other coming train show in Japan! Please follow on Facebook:Report of TRAIN SHOW,"17th JAM Convention"
Tomorrow is 17th JAM Convention! 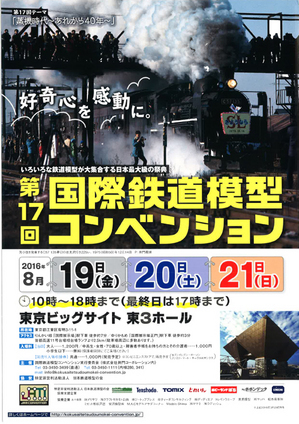 17th JAM Convention in 2016 (Train model exhibition), will be held tomorrow and we Rokuhan announce its information again! *Disclose e-Train Controller & 500 TYPE EVA　Shinkansen! And here is the information that we have already announced as special offer at only this show, and sold special price models are shown below. These special prices are only available at this show! And we will offer "Connector Pin Removal Tool" at show first time ever! We are really looking forward to seeing you all guys! Please follow on Facebook:Tomorrow is 17th JAM Convention! Thanks for your continued interest in Rokuhan products. 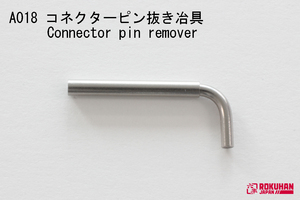 If you are interested in how to use "Connector Pin Removal Tool", Let's jump in previous link! Don't miss it too! We are looking forward to seeing you all guys at show! Let's use "Y" cable for turnout points! This time the topic is A005 turnout "Y"cable. It's very useful when planning for Island platform basic/extension set (S046-1/S046-2) which we've released recently, and show on your diorama and usual play! Let's take a look at tips below! In the illustration below, with two turnouts you would normally use two turnout controllers to control the points. However, if you use "Y cable", you can control direction of two turnout points simultaneously using just one turnout controller. Situation 1. Operate to two sets of points simultaneously. Situation 2. Operate both sets of turnout points in crossover between two straight tracks simultaneously. Situation 3. Operate both sets of turnout points in crossover between two curved tracks simultaneously. * However in situation 3, you need to switch polarity of one of the curved turnouts before operating with one controller and turnout "Y" cable. After reversing polarity of one of the curved turnouts you can operate the crossover between two curved tracks simultaneously. *As you already know, "A018 Connector Pin Removal tool" is useful when removing pins from connector body. Here is a link to previous News release, "A018 Connector Pin Removal Tool"
Please consider using "A005 turnout "Y" cable to avoid excess cables and controller when operating two sets of turnout points. Enjoy your Z scale life! During above holiday period, ROKUHAN's show room. So please contact us on Aug.17 (Wednesday) if you have any questions. ROKUHAN Online shop as well as ROKUHAN support desk will be also closed during same holiday period and resume working on Aug.17. Thanks for all your kind understanding in advance ! Follow us on facebook -->Let's use "Y"cable for turnout points! Delivery of Island platform Basic set/ Extension set starts on 2/August! on 2/August in Japan. Also started delivery for overseas same day. ●3 cars connection can be approached at both platform side. ●Consumer apply parts and labels are included. You can decorate on it optionally. 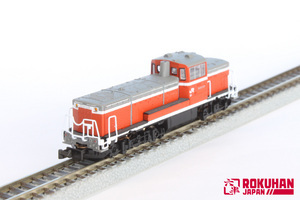 ●Combining Basic set (S046-1) and extension set (S046-2) makes longer platform and it can be stopped more cars connection. ●Chosing fence to insert on platform end makes short version platform. Let's go to the retail shop nearby you for reservation! Follow us on Facebook:Delivery of Island platform Basic set/ Extension set starts on 2/August! 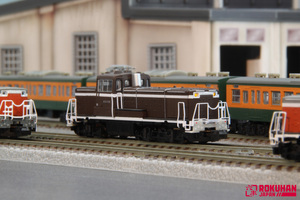 We Rokuhan will attend "17th JAM Convention", train model exhibition at TOKYO BIG SIGHT. *Disclose e-Train Controller & 500 TYPE EVA! 500 TYPE EVA is first time to be spotlighted in public at Kanto area! And also e- Train Controller is first time to be spotlighted after huge updating! We hope you all enjoy our Rokuhan booth and are looking forward to seeing you all at show!